Your Auto Mechanics and Repair Garage serving car owners in South Windsor, East Windsor, Manchester, Enfield, East Hartford and Broad Brook CT. 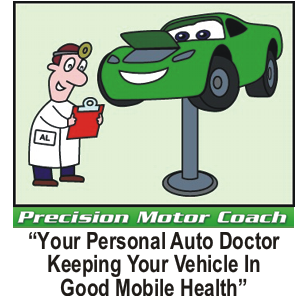 Precision Motor Coach is conveniently located at 1281 John Fitch Blvd. (Route 5), South Windsor CT 06074. We serve car owners throughout South Windsor, East Windsor, Manchester, Enfield, East Hartford and Broad Brook CT.
[address] Your Auto Mechanics and Repair Garage in South Windsor CT.
From Rt.291 to exit #4 (Rt5), north on Rt5, 6 lights to Strong Rd. Anexter/Nasua’s warehouse on right. Make U-turn @ light, next driveway on right, turn @ white sign with red arrow, – Our building is in the back. From Rt 30 to Sullivan Ave. Continue to end of Sullivan Ave; turn left onto Rt 5. Through next light, Anexter/Nasua’s warehouse on right, turn in driveway with white sign & red arrow – Our building is in the back. From Enfield, East Windsor, Broad Brook – Rt5 south to South Windsor. Aprox 2 miles from South Windsor line Anexter/Nasua’s warehouse on right, turn in @ driveway with white sign & red arrow – Our building is in the back.